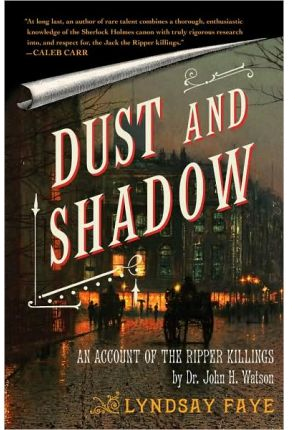 Because I Told You So: Book Report: "Dust and Shadow"
Lindsay Faye proves to be a better Sherlock Holmes writer than Arthur Conan Doyle. Seamlessly blending the iconic detective's mannerisms and eccentricities with real-life scholarly theories about the Jack the Ripper investigation, she creates a historical fiction hybrid that gives those obsessed by both the all-too-real unidentified serial killer and imaginary detective. With fevered dialogue peppered with colloquialisms of the day, Faye establishes 1888 London with vigor, inserting a Holmes on the verge of retirement. She makes lovingly subtle references to Doyle's novels by way of casually referencing a trophy Holmes picked up in previous sleuthing, or bringing up the history between the pompous genius detective and his loyal, ever-baffled assistant in casual conversation between them. Far from a slave to convention, she projects Holmes as something of a pain killer addict and self-destructive nightcrawler. Most exhilaratingly, she pushes Holmes to his breaking point and beyond. The serial killer is his match in drive and intellect to the point where he admires his craft, fears for his own life and doubts his capabilities. This is a spectacular work that would make an excellent movie or miniseries.